The Mastering the Menagerie daily quest is only available at a level 3 Menagerie inside your garrison. To upgrade your Menagerie you must complete the achievement Draenic Pet Battler to unlock the level 3 blueprints, and have a level 3 garrison (requires level 100). Once the Menagerie has been upgraded to level 3, Mastering the Menagerie will replace the previous daily from the level 1 and 2 Menagerie (Battle Pet Roundup or Scrappin'). Boldly attack, dealing 295 Flying damage plus 197 Flying damage if the user strikes first. A Solar Beam strikes all enemies, dealing 197 Elemental damage and transforms the weather into a sunny day for 9 rounds. During a sunny day, the maximum health of all pets is increased by 50%. and healing done is increased by 25%. This pet is a steady and consistent aquatic killer with Sunlight and Healing flame. Or you can kill mechanical with the 2 hit combo and still get heals off on yourself. Definitely not my favorite pet, but a decent one if you need to burn someone down quick. To make him more usable, I combine him with a Scourged Whelpling. Have the whelpling lay down Plagued Blood, then immediately switch to this guy and do Scorched Earth. Plague will heal for more than the Scorched damage to Firewing, then start spamming Deep Burn, which will heal you as well. I would recommend against using Murder to double the damage of Deep Burn. It's not worth it. 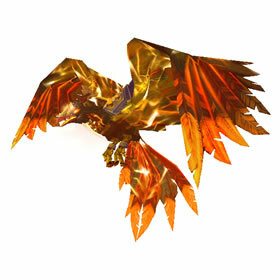 They need to add an ice version of this and Stormwing so I can name them Articuno, Zapdos and Moltres. It will also complete my fire/lightning/ice team, same idea as you're having, but not because of the names. Although I like it. I have to say this pet works out rather well, more so if buddied up with a pet that can get a boost from the Scorched Earth such as Hatespark the Tiny or any other fire elemental. Then you can keep this one for its flying skills and lay down Scorched Earth beore switching. Had some nice luck in PVP with such thus far. Just aquired one, but have yet to level it. As a non-elemental pet with Scorched Earth, it can be a double-edged sword. With Healing Flame, however, circumstances are improved. Especially being able to regain the flying buff if lost. Deep Burn has no cooldown, so this pet has great potential. Don't line her cage with paper unless you want a fire.